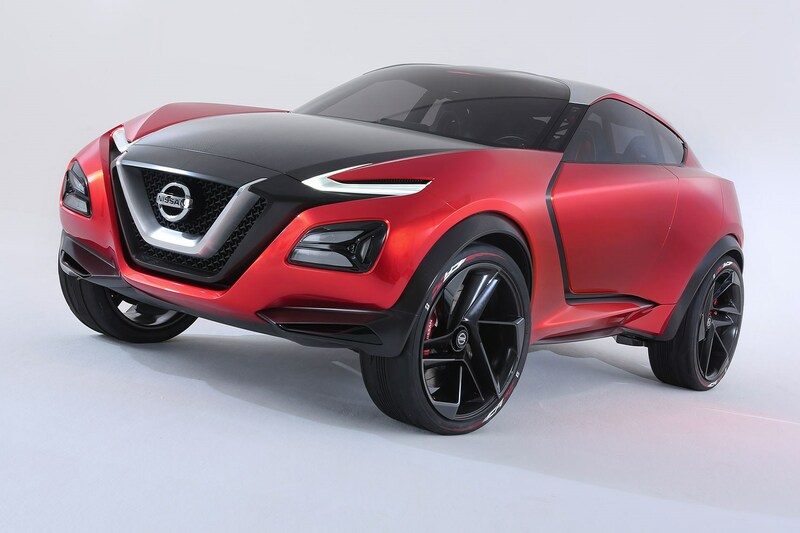 The Nissan Gripz concept car, unveiled at the 2015 Frankfurt motor show, is a glimpse at the future of crossover-kind from the modern-day pioneers of the genre. It’s a four-door, 2+2 coupe on stilts, dramatically styled to borrow elements of SUVs and Z sports cars. Nissan is adamant this does not preview a direct replacement for either Juke or Qashqai, but it seems likely that some of the Gripz’s styling will filter through to the smaller of Nissan’s crossovers, due for replacement in 2016. Its 4100mm-long footprint is very close to the Juke’s, after all. It ushers in the latest ‘emotional geometry’ design language of Nissan: check out the angled, V-shaped grille, boomerang-inspired lamps front and rear, the kinked C-pillar and a floating roof. Expect to see these motifs filter through to production cars in the next 24 months. Shiro Nakamura, Nissan’s chief creative officer, admits the concept car is exploring how crossovers could evolve. This car is designed to hark back to the 1970s Safari Rally-winning Nissan 240Z - a pumped-up coupe rally car - itself a genre-bending reminder that blurring segment boundaries is not purely a recent phenomenon. Could the Gripz become a new Z car? That’s the word on the street. The misspelling cleverly introduces a zee into the name and Nissan is keen to boost sales of its slower-selling sports cars. Reinventing them as more athletic crossovers could prove fruitful to sate the global demand for SUVs. It’s telling, too, that the Gripz is a hybrid: the powertrain uses the Leaf EV’s electric motor, but driven by a petrol engine acting as a generator, rather than driving the wheels. No performance or emissions claims have been issued yet. The Gripz is dramatic in the metal (make that composite, for it relies heavily on carbonfibre). There are no B-pillars, the wheels are huge 23-inch show-offs and cameras are embedded in the headlamp units so ‘adventures through great roads can be beamed around the world.’ We’re sure streaming the school run to drop off Oscar and Violet will prove scintillating viewing for your Facebook fans. Click here for CAR’s full A-Z of the cars to watch at the 2015 Frankfurt motor show.